When I stayed in Puerto Escondido, Mexico, I was very excited to be able to buy fresh fish on the beach every morning. The fish sold from fishermen’s boats were so fresh that some were still alive! I bought tuna and Spanish mackerel. I decided to make mulhoe, something that I had been longing to make for many years but couldn’t, simply because I couldn’t find extremely fresh fish where I live. My dream came true once I saw the fish in Mexico. I’ve always believed food is more delicious when it’s shared with many people. The more, the better, especially any dish with raw fish. I wouldn’t like to chew raw fish alone by myself in a dark room. It already sounds miserable! When I came home to New York, I made mulhoe again with top quality hoe (sashimi) grade tuna from the freezer section of a Korean grocery store. It turned out great! The photos below are from the day I made mulhoe in New York. To fully enjoy this dish, I recommend you make it with noodles: set out small bowls for everyone and let them serve themselves. They should put some spicy cold mulhoe in their bowl and add cooked thin noodles. The soup should be freezing cold and the taste is supposed to be spicy, sour, and a little sweet. You can use more or less hot pepper paste, sugar, or vinegar in this recipe, according to your taste. Anybody who loves ceviche will love this dish. When you serve this with noodles, it will make a nice simple meal. Enjoy the recipe! 1 pound of fresh fish (or frozen sashimi grade fish), hot pepper paste, hot pepper flakes, sugar, salt, vinegar, onion, garlic, lettuce, tomato, green chili peppers, roasted sesame seeds, sesame oil, water, and thin noodles. Slice 1 pound of fresh fish into thin strips ¼ inch wide and 2½ inch long (about 0.5 cm wide and 6 cm long) and keep it in the refrigerator. Put 10 cups of water into a large pot. Bring to a boil over high heat. When the water boils 15-20 minutes later, add 200 grams of thin noodles (somyeon). Stir with a wooden spoon to prevent the noodles from sticking to each other. Cook the noodles with the lid closed for a few minutes. Taste a sample. The noodle shouldn’t have anything hard inside, but it shouldn’t be mushy. When the noodles are finished, drain and rinse them in cold water a couple of times until they’re cold and a little chewy. Drain them and set aside. In a bowl, mix 4-5 cloves minced garlic, ¼ cup hot pepper paste, 2 tbs hot pepper flakes, 2 tbs sugar, 1 tbs kosher salt, ¼ cup vinegar, 2 tbs sesame oil, and 2 tbs roasted sesame seeds powder. Mix with a spoon. Thinly slice ½ cup’s worth of onion and ¼ cup’s worth of carrot. Slice 1 tomato, chop 3-4 green chili peppers and 2 cups’ worth of chopped lettuce, and add to the broth. Add 2 cups of ice cold water. Mix well then set aside. *tip: If you want to add ice cubes, use 1 cup of water and 1 cup of ice cubes. Add fish strips to the broth and mix well. Serve with the cooked noodles. Posted on Friday, March 18th, 2011 at 10:12 am. Last updated on April 26, 2015. Posted April 29th, 2014 at 1:22 am | Log in to reply. 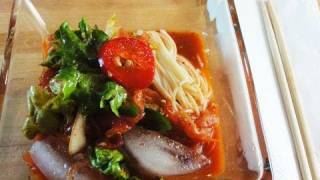 Can you please make Raw Squid Salad next time? Posted September 23rd, 2013 at 2:32 pm | Log in to reply. How did you like Puerto Escondido? Did everyone think you were Japanese? That happened to me a couple of times. Posted October 2nd, 2012 at 10:28 pm | Log in to reply. Thank you for your great great tips! Posted April 9th, 2012 at 8:07 am | Log in to reply. can I use hairtail fish? Posted April 9th, 2012 at 12:27 pm | Log in to reply. Posted August 26th, 2011 at 4:08 am | Log in to reply. im glad i found ur website. Posted March 20th, 2011 at 6:18 pm | Log in to reply. Posted March 22nd, 2011 at 9:34 am | Log in to reply. Your husband must be a big fan of your mandu! I’m looking forward to your mulhoe feedback. I take my food photos. Posted March 19th, 2011 at 1:27 pm | Log in to reply. I used to travel in Mexico alot with my family!! You make me miss it- now I want to go to Puerto Escondido! I noticed you used fresh lettuce and tomatoes and the water from the faucet. Is it considered safe to use the water and produce in Mexico now? Sometimes we used to get sooo sick from the water being contaminated. You are so adventuresome Maangchi. I love it! P.S. My 6 year old daughter thinks you like a teen ager- ha!ha! Posted March 20th, 2011 at 7:12 am | Log in to reply. “Is it considered safe to use the water and produce in Mexico now?..” Maybe I was lucky? I had no problem with the water. I always drink bottled water when I travel. “My 6 year old daughter thinks you like a teen ager” lol, thanks! Posted March 18th, 2011 at 6:53 pm | Log in to reply. Oh Maangchi!! :D This trip to Mexico was AWE-SOME right? :D I can see that you had sooo much fun :) I wish I was with you :D sorry if my english is bad today I got a very hard Work ;) . You`re such a good person :) . Posted March 19th, 2011 at 1:31 am | Log in to reply. Thank you Chris! I hope your mulhoe turns out very delicious! Posted March 18th, 2011 at 6:43 pm | Log in to reply. I can’t wait to try this! I think it is very interesting that this recipe uses lettuce which is also used in hoedupbap (my most favorite Korean dinner). Posted March 19th, 2011 at 1:32 am | Log in to reply. Posted March 18th, 2011 at 3:55 pm | Log in to reply. Wow, now that looks like Korean gazpacho! Posted March 18th, 2011 at 1:03 pm | Log in to reply. Give me fresh fish ANYTIME of the day! That looks SUPER YUMILICIOUS!!!!! What can be better than cold, spicy, fish soup on a hot humid day!??!!! 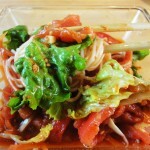 This recipe was originally posted on March 18, 2011 at 10:12 am by Maangchi. It was last updated on April 26, 2015. The video was watched 201,392 times on YouTube & has 1,291 likes!